Flake made his comments while answering reporters’ questions after delivering an address Monday evening on political tribalism that he said “is tearing the country apart.” The possible primary challenger to President Donald Trump spoke at the New Hampshire Institute of Politics, a must stop for White House hopefuls. On Friday, Flake voted to recommend Kavanaugh’s confirmation out of the Judiciary Committee, but said he wouldn’t vote for the nominee on the Senate floor without an FBI probe into the sexual assault and miscount allegations against the nominee. Lacking the votes to confirm Kavanaugh, Senate Republican leaders agreed hours later to allow the FBI to conduct a “supplemental” background investigation into the multiple claims against the president’s high court nominee, which would delay for at least a week any final full Senate confirmation vote on the federal appeals court judge. Christine Blasey Ford, who testified in front of the Senate Judiciary Committee on Thursday that she was “100 percent certain" that Kavanaugh drunkenly sexually assaulted her during a high school party in the summer of 1982, is being questioned by the FBI as part of their investigation. So is Deborah Ramirez, who claims Kavanaugh exposed himself to her when they were both inebriated at a party in college. While denying the allegations, Kavanaugh acknowledged drinking beer as a youth. Democrats have raised questions about his temperament and whether he was lying about the extent of his use of alcohol. Kavanaugh, in his testimony, slammed the allegations as part of “a calculated and orchestrated political hit” against him by Democrats. “John was always a mentor to men and he always talked about due process in particular and regular order. I don’t want to say what he would have done but I thought that the Senate needed more time and that would be good. I was really thinking of two institutions, the Senate and the court. And both, I think, needed to pause, where the ultimate nominee, if he makes it through, would have more legitimacy on the court. It will be a better situation,” he added. Flake spoke in New Hampshire after an appearance in Boston at a Forbes Under 30 Summit. At a nearby rally that drew hundreds to Boston City Hall, progressive protesters urged Flake to block Kavanaugh’s confirmation. There was a similar, smaller demonstration later in the day outside the New Hampshire Institute of Politics. Flake’s stop in New Hampshire was his second this year in the state that holds the first primary in the race for the White House, sparking more speculation regarding his presidential ambitions. Another vocal Republican critic of the president, Ohio Gov. John Kasich, will also be paying his second visit to New Hampshire this year when he returns a week after November’s midterm election. “Clearly, if you’re going to challenge Trump, New Hampshire’s the state to do it,” said David Carney, a nationally known but Granite State-based GOP consultant who’s a veteran of numerous presidential campaigns. Both Ronald Reagan—in his 1976 challenge against President Gerald Ford—and conservative commentator Pat Buchanan—who took on President George H.W. Bush in 1992—gave the incumbents major scares in the GOP primary in New Hampshire. Longtime GOP consultant Tom Rath, a former state attorney general who advised Kasich in 2016, said every incumbent needs to watch his back. 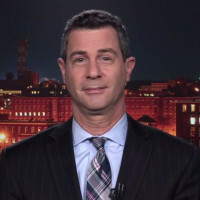 Jim Merrill, another nationally known Republican strategist who’s based in the Granite State, predicted that “if a primary challenge comes, a credible one, it will happen here in New Hampshire. And it will do better than people expect. "Not only does the size of the state make it easy to work in, the media market makes it easy to work in,” explained Merrill, a veteran of the 2004 President George W. Bush re-election campaign, former Massachusetts Gov. Mitt Romney’s 2008 and 2012 presidential campaigns, and Sen. Marco Rubio’s 2016 White House bid. Trump easily won the 2016 New Hampshire GOP primary, launching him toward the Republican presidential nomination and eventually the White House. He finished nearly 20 points ahead of Kasich, who came in second. But Trump took down a divided opposition, thanks to a large field of candidates. That likely won’t be the case in 2020, when a sitting president may face just one or two party challengers. And Trump wouldn’t be the blank slate of 2016—he now has a record in the White House. “I do think by the virtue of it being a smaller field and there now being a record to run on or run against, a candidate could conceivably do better here than in 2016,” said Merrill. Forty percent of state Republican voters would welcome a primary challenge, according to a poll released in August by the Republican-leaning New Hampshire Journal, while 47 percent said it would be a bad idea. And Carney charged that potential primary challengers haven’t yet found a doctrine that appeals to fellow Republicans. “They’re fumbling around for a message. They don’t really have a coherent message,” he said.